After a successful Edinburgh Fringe festival, Tom O’Mahony is one of the busiest comedians on the Irish circuit. 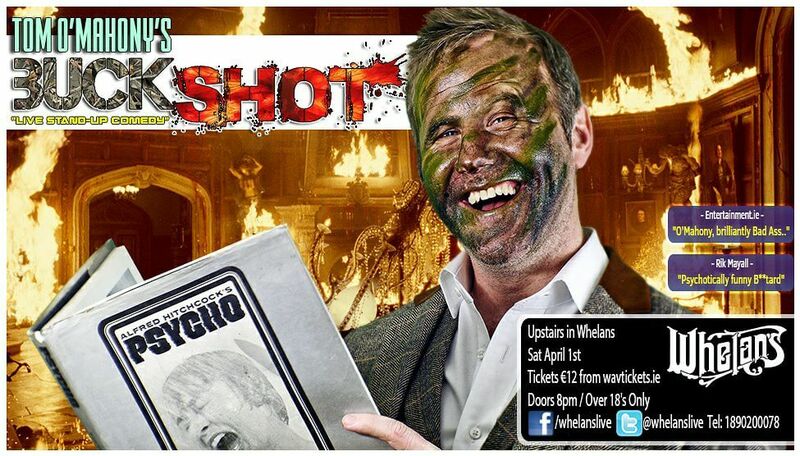 Following on from sell-out runs of his previous shows at the Edinburgh Fringe Festival and various nationwide theatres over the past 5 years, Tom opens his tour with his brand new barn-burner of a show, BUCKSHOT at Limerick’s premier comedy venue, upstairs at Dolan’s on Saturday, Feb 18 at 8pm. Tom will be supported by none other than famous Limerick comedian Karl Spain, who is Tom’s good friend and also starred with him in the very successful panto Beauty and the Beast at the University Concert Hall, this past Christmas. A ‘Tipperaryian’ ex-MMA fighter turned stand-up comedian. Tom is one of the busiest headline acts playing every major festival and club here and abroad. Since starring alongside the legendary and late, great Rik Mayall in ‘Damo & Ivor’ in 2013, returning in 2014 for Season 2, reprising his role as the intolerable toff, ‘Tarquin’, Tom has been a regular on Irish TV from Republic of Telly, Irish Pictorial Weekly, Bridget & Eamon, 3e’s ‘Uploaded-Uncut’ and Irish Ghost Hunters. He’s also a regular on national radio, 2FM’s Breakfast Republic and Spin 1038’s Fully Charged. Tom O Mahony BUCKSHOT is set to take place on Saturday, February 18 at 8 pm upstairs at Dolan’s . This gig is a strictly over 18’s event. Tickets are priced at €12 each and can be purchased from the venue’s website.